-> -> -> Readers may want to download the Additional Materials for this book. -> -> -> will assist you in navigating through the book. 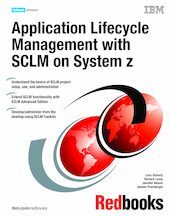 In this IBM® Redbooks® publication, we describe and document a number of different aspects of the Software Configuration and Library Manager (SCLM) in the context of the overall IBM Software Delivery Platform (SDP) offering of the Rational® Brand. SCLM is considered to be a complete Software Configuration Management System (SCM) for artifact management via source and version control, build management, and promotion management of artifacts with an open interface to connect to other components required in the Application Lifecycle Management (ALM).